King's Bay, Georgia, is near St. Mary's, Camden County, Georgia, on an arm of Cumberland Sound, 35 - 40 miles north of Jacksonville, Florida. The base encompasses approximately 16,000 acres. Military and civilian personnel, including contract personnel, number more than 9,000. 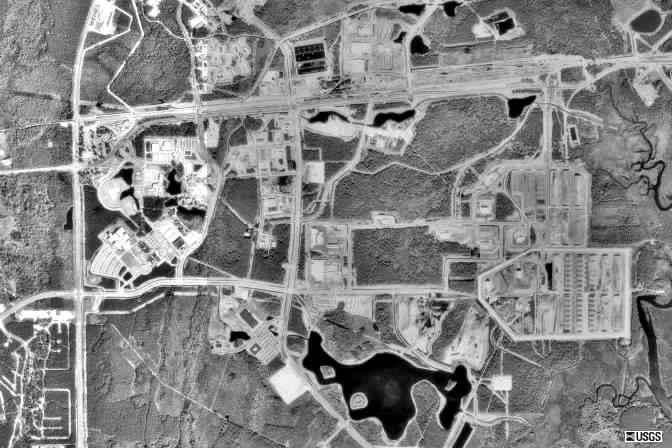 In 1954, the Army began to acquire land at King's Bay, on which it planned to build a military ocean terminal which would be used to ship ammunition in the event of a national emergency. Construction activity began in 1956 and was completed in 1958 at a cost of $11 million. Because there was not immediate operational need for the installation, it was placed in an inactive ready status. A Treaty of Friendship and Cooperation was being drafted with Spain in 1976. It would require withdrawal of Submarine Squadron Sixteen from Rota, Spain, by July 1979. 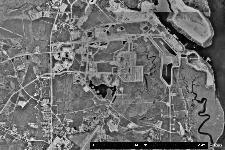 As a result, the CNO ordered, in 1976, a study to select a new site for relocating the SSBN tender from Rota to the East Coast. A site selection steering group evaluated sites along the Atlantic and Gulf coasts. On 30 November 1976, the SECNAV announced that King's Bay, Georgia, has been identified for further study as the preferred alternative location for the possible construction of an East Coast FBM Tender refit site. It was on 26 January 1978 that the SECNAV announced that King's Bay, Georgia, would be the new location of the submarine tender to support Submarine Squadron Sixteen. Preparations were started for an orderly transfer of the property from the Army to the Navy, and the actual transfer took place on 1 July 1978. Throughout the remainder of 1978 and into 1979, preparations for the arrival of the submarine squadron went forward with haste. On 2 July 1979, the commander of Submarine Squadron Sixteen, embarked in the submarine tender USS Simon Lake (AS-33), arrived at King's Bay. Four days later, the USS James Monroe (SSBN-622) entered King's Bay and moored alongside the USS Simon Lake's (AS-33) starboard side to begin a routine refit in preparation for another deterrent patrol. In May 1979, the SSBN tender refit site at King's Bay was selected by the Navy as its preferred site for an East Coast strategic TRIDENT submarine facility in the Atlantic, similar to SWFPAC at Bangor, Washington. Following environmental impact studies, in October 1980, SECNAV Edward Hidalgo announced the decision: King's Bay would become the Atlantic home for the new Ohio-class submarines. On 1 April 1982, the title of the base was changed from Naval Submarine Support Base to Naval Submarine Base to reflect the growing significance of King's Bay. Facilities at the base enable King's Bay to serve as a homeport, refit site, and training facility for the Navy people that operate and maintain the Ohio-class strategic submarines. The original facilities here, to refit between patrols SSBNs which were homeported elsewhere, cost approximately $125 million. The TRIDENT basing decision touched off a building project of vastly-larger magnitude. Through the 1980's, the Navy spent more than $1.7 billion in the military construction effort alone. The first Trident submarine, USS Tennessee (SSBN 734), arrived Jan. 15, 1989. Tennessee was followed by USS Pennsylvania (SSBN 735), USS West Virginia (SSBN 736), USS Kentucky (SSBN 737) , USS Maryland (SSBN 738), USS Nebraska (SSBN 739), USS Rhode Island (SSBN 740), USS Maine (SSBN 741), and USS Wyoming. The final submarine, USS Louisiana, arrived in the summer of 1997. Kings Bay, Georgia lies in marshy, flat terrain behind a long, low barrier island which separates it from the open ocean. Submarines reach their base at Kings Bay via a long channel which has been cut through the shallow coastal shelf and muddy tidal sound. The only natural shelter from winds is provided by forest and the development of a hurricane anchorage is precluded by the poor holding quality of the bottom in the sounds. Furthermore, the deeply cut access channel would be subject to sudden shoaling under certain circumstances of a hurricane strike. The Kings Bay submarine base is evidently extremely vulnerable to the effects of a hurricane strike. Despite this potential vulnerability, the risk of submarine operations being disrupted is reduced considerably by the rarity of direct landfalling hurricanes along the neighboring coast. The more commonplace threats are posed by hurricanes which pass close offshore without making landfall or after exiting along the Florida coast to the south of the St. Marys Entrance. These hurricanes have remarkably little impact at Kings Bay and would not merit the sortie of the submarine squadron. However, sortie of ocean-going Navy units would be justified for the rare direct landfalling hurricane and more commonly, for those hurricanes approaching overland which, instead of exiting to the south, threaten to pass close to the west of Kings Bay or make a direct strike. 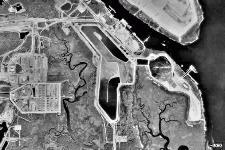 On 13 July 2015, the Department of the Navy announced that it had signed real estate outgrant with Georgia Power, a subsidiary of Southern Company, to develop a large-scale, solar generation farm at Naval Submarine Base (SUBASE) Kings Bay. Plans called for the 42 megawatt (MW) direct current (DC) facility to be constructed on SUBASE Kings Bay located in St. Marys, Ga. The signing of this document marked the start of a new collaboration between the DON and Georgia Power to develop renewable energy aimed at increasing DON's energy security and diversifying Georgia Power's energy portfolio. As part of the outgrant, Georgia Power was given access to 258 acres of land for the development of ground-mounted solar photovoltaic panels, with a nameplate capacity of 42 MW DC, or 30 MW of alternating current. The power generated by the solar farm is to be routed to Georgia Power's transmission lines, to benefit their customers. At the time of the announcement, Georgia Power expected to break ground on the project late summer 2015 with the facility coming online by the end of 2016. Secretary of Defense Recommendation: Close Naval Submarine Base New London, CT. Relocate its assigned submarines, Auxiliary Repair Dock 4 (ARDM-4), and Nuclear Research Submarine 1 (NR-1) along with their dedicated personnel, equipment and support to Submarine Base Kings Bay, GA, and Naval Station Norfolk, VA. Relocate the intermediate submarine repair function to Shore Intermediate Repair Activity Norfolk, at Naval Shipyard Norfolk, VA, and Trident Refit Facility Kings Bay, GA. 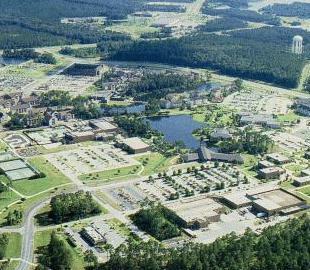 Relocate the Naval Submarine School and Center for Submarine Learning to Submarine Base Kings Bay, GA. Consolidate the Naval Security Group Activity Groton, CT, with Naval Security Group Activity Norfolk, VA, at Naval Station Norfolk, VA. Consolidate Naval Submarine Medical Research Laboratory Groton, CT, with Naval Medical Research Center at Walter Reed Army Medical Center Forest Glenn Annex, MD. Relocate Naval Undersea Medical Institute Groton, CT, to Naval Air Station Pensacola, FL, and Fort Sam Houston, TX. Consolidate Navy Region Northeast, New London, CT, with Navy Region, Mid- Atlantic, Norfolk, VA.
Secretary of Defense Justification: The existing berthing capacity at surface/subsurface installations exceeds the capacity required to support the Force Structure Plan. The closure of Submarine Base New London materially contributes to the maximum reduction of excess capacity while increasing the average military value of the remaining bases in this functional area. Sufficient capacity and fleet dispersal is maintained with the East Coast submarine fleet homeports of Naval Station Norfolk and Submarine Base Kings Bay, without affecting operational capability. The intermediate submarine repair function is relocated to Shore Intermediate Maintenance Activity Norfolk at Norfolk Naval Shipyard, and the Trident Refit Facility Kings Bay, GA, in support of the relocating submarines. Consolidating the Naval Submarine Medical Research Laboratory with assets at the Walter Reed Army Medical Center Forest Glen Annex will create a DoD Center of Hyperbaric and Undersea Medicine that will increase synergy by consolidating previously separate animal and human research capabilities at a single location. The consolidation of Navy Region, Northeast with Navy Region, Mid-Atlantic is one element of the Department of the Navy efforts to reduce the number of Installation Management Regions from twelve to eight. Consolidation of the Regions rationalizes regional management structure and allows for opportunities to collocate regional entities to align management concepts and efficiencies. Community Concerns: The New London community argued the closure of the Submarine Base would eliminate a critical US military strategic presence. Advocates repeatedly expressed concerns that the closure would sever longstanding synergies with the Submarine School, Submarine Development Squadron 12, Electric Boat Company (which designs, constructs, and maintains nuclear submarines), Naval Undersea Medical Institute and such nearby facilities at Newport, RI, as the Naval Undersea Warfare Center, Surface Warfare Officers School and the Naval War College, as well as loss of nearby college and university centers of undersea research. They argued DoD's closure recommendation deviated from the 20-year Force Structure Plan because it was premised on fewer attack submarines than their understanding of the requirement, and would restrict the future Navy because of insufficient basing capacity. Further, they asserted DoD undervalued New London's military value by not considering tenant commands such as the Submarine School, piers, Submarine Support Facility, and synergy relationships. 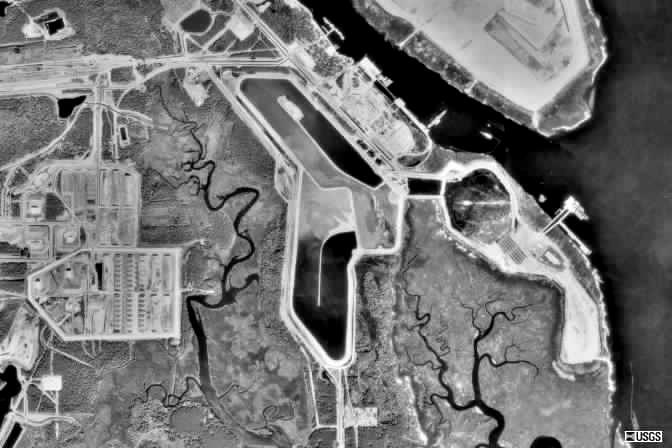 Advocates claimed closure costs were greatly underestimated due to environmental considerations, personnel relocation and reconstitution of facilities at Norfolk, VA, and Kings Bay, GA. Similarly, savings were overestimated because of unrealistic personnel savings and construction requirements at Norfolk and Kings Bay to accommodate relocations. Last, the community projected a much greater economic impact on the local and extended area because of jobs associated with not only the base, but also those losses attendant with supporting facilities, including Electric Boat. The Camden County, GA, community supported the closure recommendation, claiming the Navy can adequately support the current 55 Fast Attack Submarines. They claimed a lower force structure number would simply add to excess capacity. They backed DoD's assessment of relative military value for submarine bases. 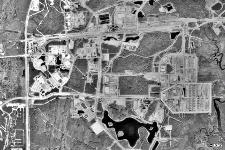 Kings Bay, a multi-use base, would provide synergy opportunities by collocating Fast Attack Submarines with a Fleet Concentration area that provided operating, training and maintenance interchange with Fleet Ballistic Missile Submarines as well as Fleet Surface and Aviation units. They asserted that DoD calculations adequately considered construction costs, environmental considerations and potential savings. Advocates for Kings Bay indicated that with several thousand acres of unencumbered, developable land, there is ample capacity to accommodate relocated personnel, submarines, support and equipment. The community adamantly claimed there would be more than an adequate amount of high quality housing, educational and quality-of-life facilities to support an increased military population since the military presence would still be less than that supported in Camden County ten years ago. Commission Findings: The Commission found that excess capacity exists in the surface-subsurface category, that significant savings would accrue, and that a solid business case was made for closure of Submarine Base New London. However, the Commission also found that decoupling and displacing long-standing collocation relationships with undersea centers of excellence, the Submarine School and a nearby submarine construction company could adversely affect operational readiness. In addition, the Commission found the argument of overall economic impact compelling. Further, the Commission's analysis found serious doubts about the threat assessment and resultant Force Structure Plan basis for the number of required Fast Attack Submarines. These factors combined to present an inherently unknowable and therefore unacceptable security risk to national security if the base were to close. 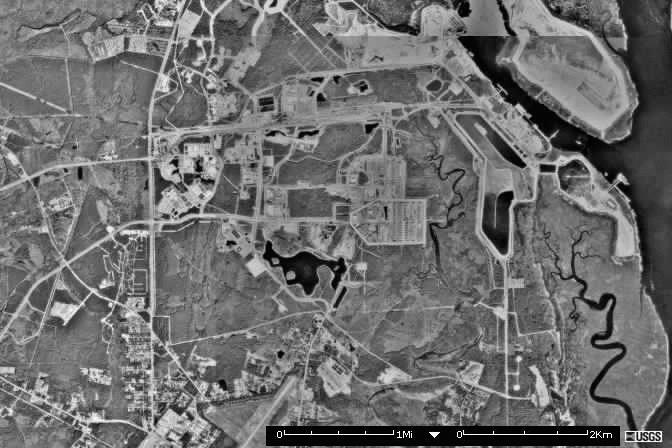 Realign Naval Submarine Base New London, Connecticut by consolidating Navy Region Northeast, New London, CT, with Navy Region, Mid-Atlantic, Norfolk, VA. The Commission found this change and the recommendation as amended are consistent with the final selection criteria and the Force Structure Plan. The full text of this and all other recommendations can be found in Appendix Q.